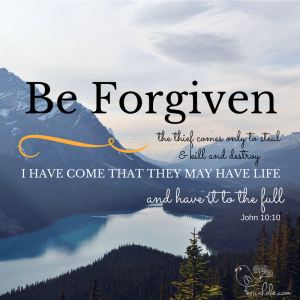 Being forgiven means we are freed from the chains of sin and death. But it is also a gift meant to allow us to live a life of joy and freedom! You can have the assurance of salvation but miss out on the part where you live as a free, worthy, precious child of God. And that’s not OK, friends. It’s not OK for us to miss out on the great love that the Father has for us. His love for us changes everything. It has the ability to transform your heart, and your whole life. It has the power to work through you and make a powerful difference in the world around you, the power to change the lives of those you come in contact with. But you have to accept it, you have to let it sink in. The enemy has no power over what happens in heaven once we get there. But he does his best to wreck our joy and our effectiveness here in the broken world, and one of the very best ways to keep a Christian down is to mire her in shame. Shame is a joy-stealer, a relationship killer, and a confidence destroyer (click to Tweet). Those things are right from the enemy, who is continually whispering lies to us about our worth. But God’s gift is that we have life, and have it to the full! We need to be free to fully live the life God has given us, and shame is a roadblock to that freedom. Beautiful posting–and a powerful, moving audio program on “Be Forgiven”. I hope you will be able to use a version of this program in your prison ministry work. And I hope, too, you will be inspired to deliver more such programs at The Rock and in other faith communities.